Getting to Know You! 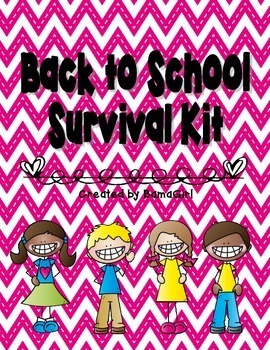 - Cute worksheet/poster that is a perfect activity for the 1st days of school. Color them for a cute bulletin board! Classroom Helpers - Put this handy sheet out for parents to sign up to be a classroom volunteer. Student Info Cards - Print these cards on cardstock, and have parents fill them out. Put on a ring or in a binder to keep your students’ info handy. Classmate Scavenger Hunt - Great ice breaker activity to get your kids out of their seats and learning more about each other. Rules Sort	- Cut and paste activity where students sort basic rules on a T-chart. Would You Rather… - Fun activity to get kids thinking and to learn some fun (and crazy) facts about each other. Classmate Compare/Contrast - Students use their interview skills with a classmate to complete this Venn diagram with similarities and differences. Welcome Back to School postcards - Print these postcards on colorful cardstock. Mail to your students at the beginning of the year, or simply have them on their desk with a personal note on the back. 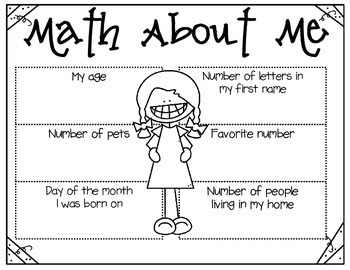 Math About Me - Students complete the poster by writing math problems about themselves. Girl and boy posters are included. Perfect activity for a classroom bulletin board! What’s In the Bag? 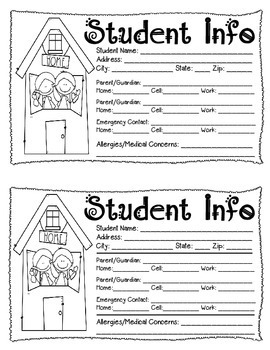 - Print these sheets and attach them to a lunch sack for a simple getting-to-know-you homework activity. Name Poem - Students write a poem using the letters in their first names. Templates are included for names with 6, 7, 8, 9, and 10 letters! Our Classroom Family Tree	- Classroom "community building" art activity. Each student draws a self-portrait of their head, and glues it to the family tree. Display in the classroom, or make copies for each student. Pair this with the Name Poems and make a class book! 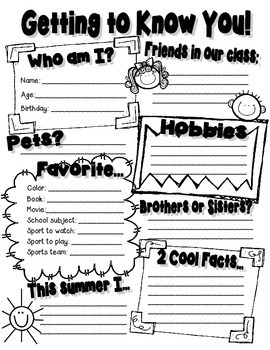 My Summer Vacation - Lined writing paper for students to write about their summer. Girl and boy templates are included. My Class Grid/Check-Off Sheet - Every teacher’s must-have beginning of the school year grid. Just write in your students’ names, make copies, and use this handy tool all year! Class Welcome Bags - Put together these cute little bags to welcome your students to your class. Gather the items, copy the template on colorful paper, and put it all in a zip-loc bag. Your students will love this simple welcome gift! Absence Note - Send copies of this simple note home with parents at the beginning of the year. Parents fill in the blanks and return when their child is absent from school. Keep extra blank copies on hand to send home when a child forgets to bring an excuse.